Marbella cave of "La Pileta"
The Pileta Cave is situated in Benaojan, in Marbella, and it’s an important prehistoric site with cave paintings and Palaeolithic engravings, as well as an attractive tourist destination in the Ronda mountains. The area where the cave is located was originally in the seabed’s sediments as from the Jurassic period, going from being under the waters of the Guadiaro river at one point, which modified most of its internal structure, to gradually open up the main entrance in time, due to the crack of the mountain, caused by a fault. The presence of humans existed in these caves for a long time, the chronology of the paintings indicate an origin of approximately 20.000 years ago. There is no artificial illumination, so the visitors are provided with torches. 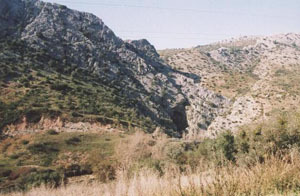 The Pileta Cave is now situated at an altitude of 670 metres, in the rocky mountain ranges of El Palo and Juan Diego, parallel to the Guadiaro river. To get there, one must follow the road that goes from Benaojan to Cortes de la Frontera. Straight after the kilometre 4.5 there’s a signposted turnoff to the right that leads to the flat surface area where we can park our vehicles. From there we can walk up a stony set of stairs to the entrance of the cave. From the cave’s location we’ll also enjoy some breath-taking views. The Pileta Cave is open every day of the year, from 10am to 1pm, then from 4pm to 5pm, which is when they allow the entrance of the last visiting group. After the 15th of April, making the most of the daylight as it gets dark a bit later, the cave allows the entrance of the last group at 6pm. Every visit inside the cave is guided and with a maximum of 25 people per group.